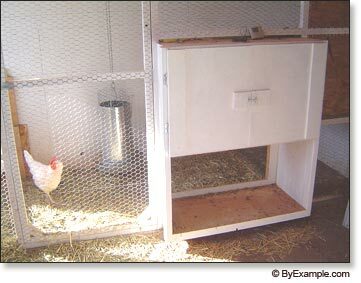 We've modified our chicken nesting boxes and it has made a huge difference in the behavior of our egg laying chickens. This past fall our egg production numbers fell significantly when our chickens developed a habit for routinely eating eggs. After a bit of research we decided to modify the nesting boxes, from large communal boxes to shoe box size nesting spaces. The birds actually seem to be more comfortable with the smaller nesting boxes. In fact, we had a few birds who used to lay their eggs on the floor instead of in the communal nesting boxes. After modifying the nesting boxes, all of the birds lay their eggs in the nests. 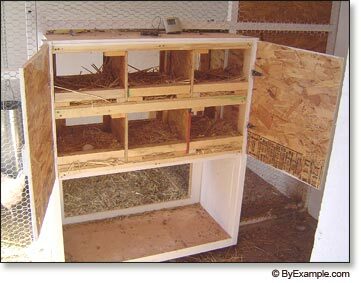 The smaller nesting boxes also prevent the chickens from fouling their nests and kicking the straw onto the floor. As a result we are getting eggs that are much, much cleaner than before and we are using less straw. Since we made the changes to our nesting boxes 3 months ago we also haven't seen any signs of egg eating by our chickens. We believe that the smaller nesting boxes are the main reason for the improvement of our flock's behavior. With the new nesting boxes in place egg production levels have returned to normal. After observing our chickens we would agree that the new dimensions of the nesting boxes seem to suit our small flock. We have a dozen chickens total and two breeds: Leghorns and Rhode Island Reds. The smaller entrances serve several functions. We have found that we need about 2" of straw in the bottom of each nest to keep the eggs from being accidentally cracked when they are laid. The smaller entrances help to hold the straw in the nest and keep the eggs safe. They also give the nest boxes a dim, cave-like feel. Our chickens do seem to prefer the small, dark and cozy nest boxes. Since they are several feet above floor level, we also provided a perch in front of the nest box entrances to create easy access for our chickens. When building nest boxes it makes a lot of sense to size the boxes to the birds that will be using them. We chose the nesting box dimensions above to prevent the birds from standing in the nests. In our experience standing in the nest encourages several undesirable behaviors: egg eating, scratching straw onto the floor and fouling the nests. The shorter nest boxes prevent these behaviors and reduce dirty, cracked and pecked eggs. There are plenty of nest box plans out there and most of them are pretty basic. 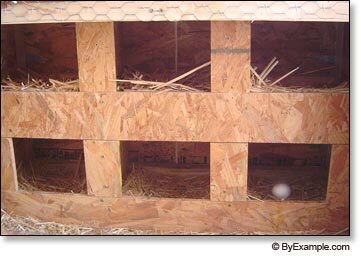 Some nest box plans are more sophisticated and even incorporate "egg chutes" for moving eggs out of the nest to prevent egg eating. 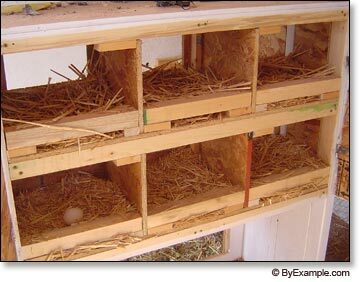 Once we managed to eliminate egg eating within our flock we decided to stick with our fairly simple nest box design. However we made one more major improvement to our chicken nesting boxes that has made daily egg collection an even simpler task. Our nest boxes are located inside the chicken coop, which is inside our passive solar barn. In the first version of our nest boxes, eggs could only be collected by entering the chicken coop. The frequent intrusions into the coop not only disturbed the birds, but almost always left my shoes covered in muck. To improve the situation, we built doors on the back side of the nest boxes that allow egg collection from outside of the chicken coop. When we first discussed this plan, I was worried that the eggs might roll out onto the floor when the doors were opened for egg collection. To prevent this from happening, we included a 2" lip on the back of each of the nest boxes to keep the straw and eggs in the nest. The nest box doors make egg collecting easy and clean. I would recommend a similar configuration to anyone looking for nest box plans that are both simple and functional. Click here for more information on our flock of egg laying chickens. The article includes egg productivity charts, general information about the methods we are using to raise our chickens and also DIY plans for an automatic chicken light. Click here to read more about our chicken coop. Click here for more information on our passive solar barn.